We have been growing a lot of small round hybrid squash. They are variations on the French round squash, the ronde de nice. There is a hybrid often called an eight-ball and now there are several varieties ranging from yellow to a dark green. They are the perfect squash for a leftover/planned over meal. They are beyond easy to core and stuff with the dregs of the refrigerator, turning little bits and pieces into a gorgeous meal. 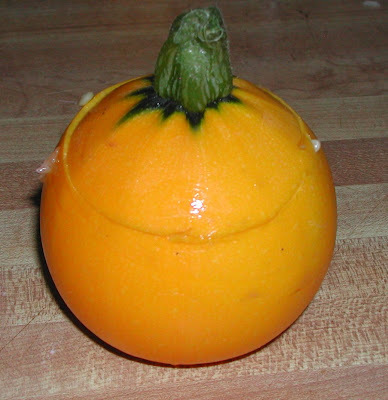 All you have to do is cut off the top of the squash, remove the seeds, stuff the squash with a filling, and bake. You can use the same technique with an oblong squash or zucchini. 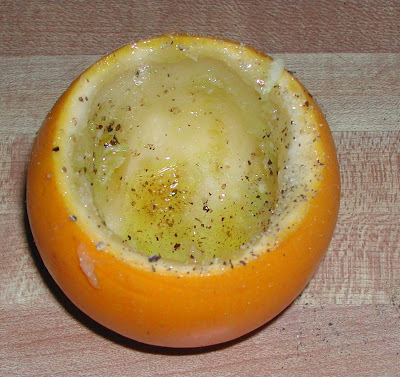 Simply slice in half, scoop out the seeds and stuff. The best mixture for the filling includes following combination. If you are a vegetarian, leave out the meat and add an extra vegetable. 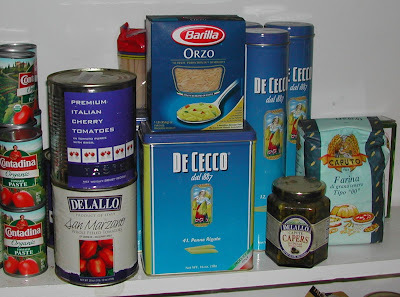 There are some crossovers, onions can be aromatics or vegetables. Cheese works as a protein or a binder. 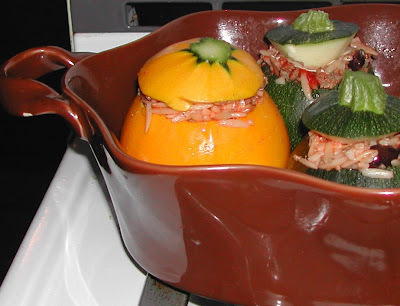 It is basically a little casserole stuffed into an edible bowl. One from each group works fine. Any aromatics to flavor the filling such as onions, garlic, shallots, olives, anchovies, lemon, rosemary, thyme, sage, cilantro or any other spices you have handy. This is a great way to use a leftover chicken breast, roast beef, ham or shrimp. Ground meats like hamburger, sausage, lamb are quick additions. Even tofu or cheese. Leftover rice, potatoes, tabbouleh, quinoa, bread, or cornbread. You don’t want the stuffing to be dry, so you need a little something to bind the stuffing. Tomato paste, pesto, broth, milk, an egg, cheese, leftover gravy or sauce. 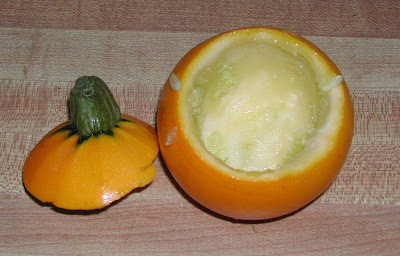 Each squash, when hollowed out, will hold about 1/2 cup of filling. So if you are cooking 4 squash, you need 2 cups of stuffing. If you have a lot of extra stuffing, you can always cook it in the bottom of the pan, thought the squash ball won’t look quite as “Food & Wine." After the weekend, I had a bit of extra hamburger, part of an onion, some olives and some little balls of mozzarella. I made a little orzo, added some hot red pepper and some tomato paste. 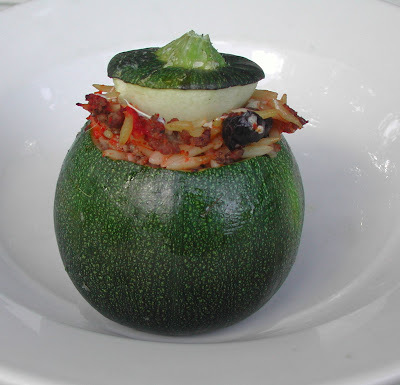 I picked some lovely squash ball and made an Italian Stuffed Squash. Cut the top off the squash and scoop out the seeds. Salt and pepper the inside of the squash and add 1/2 teaspoon olive oil. Sauté onions until translucent and set aside. Fry the hamburger in a skillet about 5 minutes, drain fat. Add the onions, olives, red pepper, cooked orzo, tomato paste and mozzarella to the hamburger and mix. Spoon the hamburger mixture into the squash and replace the top. Set the filled squash into a baking pan, add a 1/4 cup water into the bottom of the pan. Here’s another favorite. I always have leftover chicken. If I have leftover chicken, there is usually leftover rice. Add some onions, cheese, some chopped celery, maybe a few peas and you are good to go. Sauté the onions, celery, thyme, and mushrooms in 1 teaspoon olive oil about 5 minutes. Add the chopped chicken, leftover rice, broth and cheese to the sautéed vegetables. 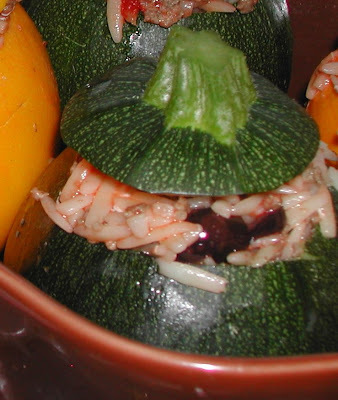 Stuff into the prepared squash.